(339/9) 162-166 Turk Street; El Rosa Hotel, Helen Hotel (1985). 1906. (339/8) 150 Turk Street; Star Garage. 2B stories; reinforced concrete structure; stucco facade with galvanized iron column order, swags at ground level, and huge elliptical fanlight; composition: enframed window wall; Renaissance/Baroque ornamentation. Alterations: none. Original owner: Harry R. Bogart 1921. Architect: Joseph L. Stewart. 1921. (339/7) 136-140 Turk Street; The Earle Lodgings, Boston Hotel (1907). Lodging house with forty-one rooms and two baths. 3B stories; brick structure with stucco facade; blue and gold tile storefront, galvanized iron cornice; two-part commercial composition; Renaissance/Baroque ornamentation; tile vestibule; lobby: stair landing with remodeled finishes. 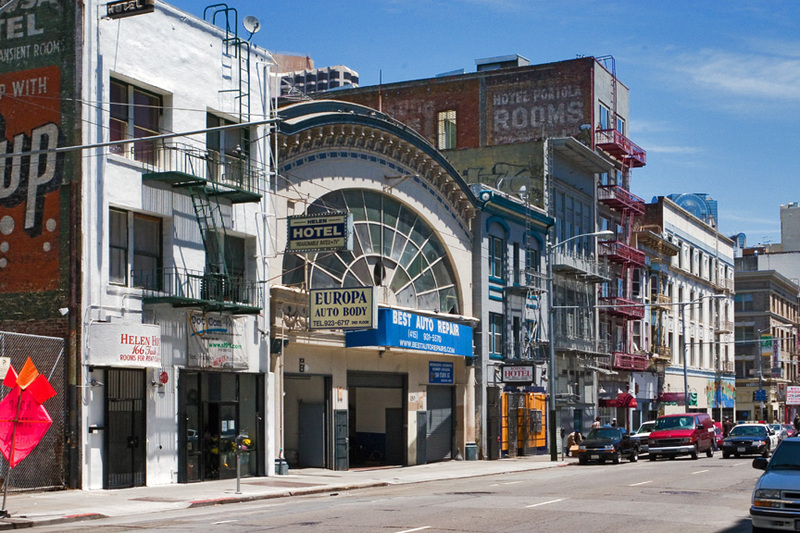 Alterations: “Blue and Gold” letters removed from storefront; former tenant: Blue and Gold Bar (1983), now San Francisco Rescue Mission (2007). Original owner: Mrs. Alicia McCone. Architect: Charles M. Rousseau. 1907. 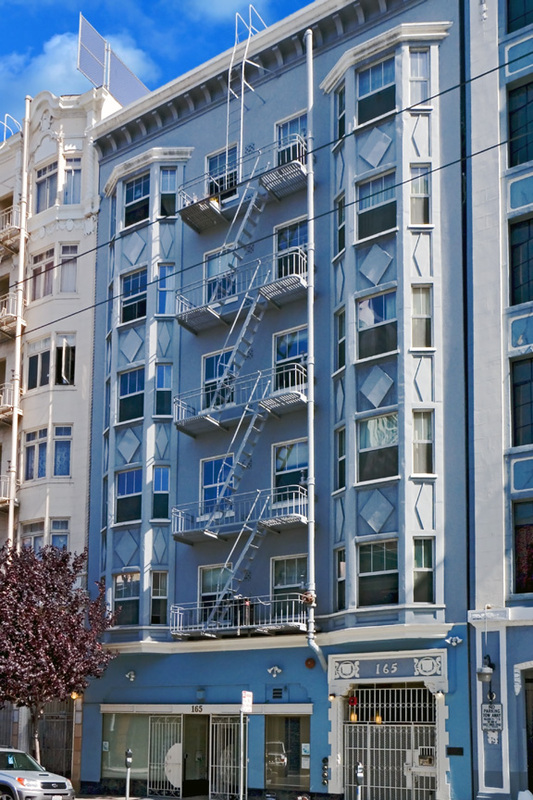 (339/6) 130-134 Turk Street. Store and restaurant, converted to lodging house by 1981 with eighty-two rooms (possibly cribs) and five baths. 3B stories; reinforced concrete with stucco facade; facade scored like stone masonry, galvanized iron cornice; two-part vertical composition; Renaissance/Baroque ornamentation; alterations: belt course over ground level removed, windows boarded up, storefront. Original owner: Emma Dixon. Architect unknown. 1923. (339/5) 124-126 Turk Street; Hotel Portola, Marathon Hotel, Lowell Hotel, Argue Hotel, Camelot Hotel. Rooming house with fifty-seven rooms and thirty-two baths. 6B stories; faded painted sign on upper west wall for “Hotel Portola . . . Rooms . . .”. Alterations: windows replaced with aluminum and all ornament and finishes except decorative iron fire escape on facade altered since 1983. Architect: Albert Farr. 1907. (339/4) 116-120 Turk Street; The Elite lodgings, Hotel Holly, Porter Hotel, Youth Hostel Centrale. Rooming house with twenty-six rooms and six baths. 3B stories; brick structure with glazed brick facade; terra cotta wreath over entry and galvanized iron trim and cornice; 2-part commercial composition; Renaissance/Baroque ornamentation; vestibule: mosaic floor with “116”; lobby: stair landing with cornice molding. Alterations: storefront; former tenant: Port Hole Bar. Original owner: Mary A. Deming. Architect: E.A. Hermann. 1910. (339/3) 101-121 Turk Street;) Hotel Hyland (1907, Hotel Young (1908), Hotel Empire (1911), Chapin Hotel (1920), Hotel Raford (1923), Tyland Hotel. Stores and rooming house with 115 rooms and fifty baths. 4B stories; brick structure; stucco facade, moldings, cartouches, bosses, beltcourses; three-part vertical composition; Renaissance/Baroque ornamentation. Alterations: ground level, storefronts, vestibule, aluminum windows, cornice removed. Site of 1966 Compton Riot at Compton’s Cafeteria, first documented U.S. riot by gay and transgender men and women against police. Original owner: Woodward Investment Company. Architect: A.M. Edelman. 1907. (340/12) 108-120 Taylor Street; St. Ann Hotel, Hotel Lennox, Bard Hotel, Notel Winfield, Hotel Warfield (1923). 1907. Interspersed among the Tenderloin’s densely-packed residential buildings are various commercial buildings designed to serve residents’ needs, mainly stores and auto repair and parking garages. There are also churches, union halls, a YMCA, a theater, and film exchange buildings. Lower Turk, 1920. Note the glass-paned marquee over the entrance to the Camelot Hotel. In 1948 the Port Hole moved to the first block of Mason Street, where it continued to operate into the 1950s. During the years that Treasure Island was an active US Navy base, the Tenderloin bars favored by on-leave sailors were the Port Hole, the Blue and Gold at 136 Turk, and the Coral Sea at 220 Turk. (343/17) 161-165 Turk Street; El Crest Apartments, 165 Turk Street Apartments. Twenty-one two- and three-room apartments. 6B stories; reinforced concrete structure; stucco facade; two-part vertical composition; Spanish Gothic ornamentation; vestibule: tile floor, paneled walls, cornice moldings; storefront: largely intact including vestibule with tile floor. Alterations: aluminum windows. Original owner: F.W. Hess. Designer: James H. Hjul, engineer. 1923. 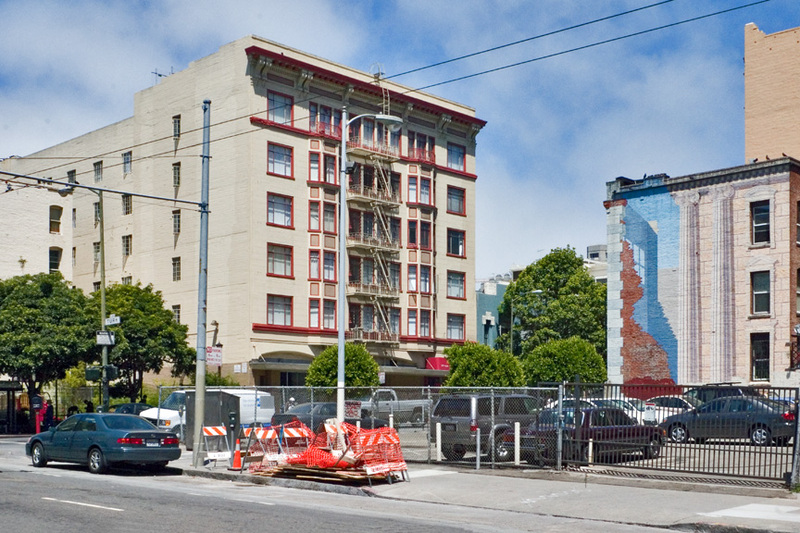 The former El Crest Apartments are now owned and operated by the Tenderloin Neighborhood Development Corporation. The storefront at 161 Turk Street (renumbered 165) was formerly the Record Exchange, home of Bill Melander’s world-famous record collection. (333/1) 401-421 Ellis Street; Gashwiler Apartments, St. George Apartments. Apartment building with eighteen two-, three-, and four-room units. 4B stories; brick structure with galvanized iron cornice; keystones, bracketed lintels; two-part vertical composition; Renaissance/Baroque ornamentation; vestibule: square column order with decorative tile at entry, mosaic floor, paneled walls and ceiling, wood and glass doorway; lobby: stair landing; storefronts: Moderne corner bar (“Jonell”) with vitrolite between tile-faced storefronts; bronze plaques flank door with “St. George 2-3-4 Room Apartments”; partial alterations to storefronts. Original owner: Laura Lowell Gashwiler. Architect: Julius E. Krafft. 1907. (333/2) 345 Jones Street; apartment hotel with thirty one-, two- and three-room units. 5B stories; reinforced concrete structure; stucco facade, five-story bay windows, galvanized iron cornice, three-part vertical composition; Renaissance/Baroque ornamentation; vestibule: Moderne entry frame. Alterations: security gate. Original owner: Mrs. J. Baldwin. Architect: O’Brien Brothers. 1912. (333/4) 335-341 Jones Street; stores. 1-story; reinforced concrete structure. Alterations: facade stripped of all ornament. Original owner: Robert Ibersen. Architect: T. Paterson Ross. 1919. (333/5) 333 Jones Street; garage. 2-stories; reinforced concrete structure; stucco facade, castellated parapet; two-part commercial composition; alterations: steel roll-up doors. Designer and owner unknown. l930. (333/6) 302-316 Eddy Street; Herald Hotel. Mid-priced hotel with 159 rooms and 106 baths. 7B stories; steel frame structure and brick walls with terra cotta trim; second floor window surrounds, belt courses, three-part vertical composition; Renaissance/Baroque ornamentation; vestibule with coffered ceiling; lobby: desk and lounge space with pilaster order and coffered ceiling; iron and glass marquee with “Hotel Herald”. Alterations: entry, storefronts replaced in style of 1910s. Owners: Laura Hirschfeld 1910, Citizens Housing Corporation and RHC Communities 2004. Architect: Alfred Henry Jacobs 1910, Schwartz & Rothschild 2004. 1910. The storefront at 335 Jones Street (identifiable in this photo by the blank, pink-colored blade sign) was formerly the Black Rose, a transgender bar that featured live impersonations of famous female singers. A friend of mine, Nikki Harris, used to perform there as Ella Fitzgerald. The St. George Apartments were originally named for Laura Lowell Gashwiler, widow of a gold mining millionaire and one of the first kindergarten teachers in the United States. (336/2) 225–229 Hyde Street; Hotel LaSalle, The Cosmopolitan Hotel. Mid-priced hotel with 128 rooms and 128 baths, converted to apartments. 6B stories; reinforced concrete structure with stucco facade; twisted colonettes in four-story bay windows, wrought iron balconies, galvanized iron cornice; three-part vertical composition; Renaissance/Baroque ornamentation; alterations: lobby and ground floor remodeled 1950s, creating recessed vestibule with plaster, aluminum and glass door. Original owner: A.B. Hasbacher. Architect: unknown. 1927. (337/21) 200–216 Hyde Street; parking lot (Black Hawk site). (337/12) 222–226 Hyde Street; flats. (Trompe l’oeil mural on south wall by John Wullbrandt, 1983). 1911. 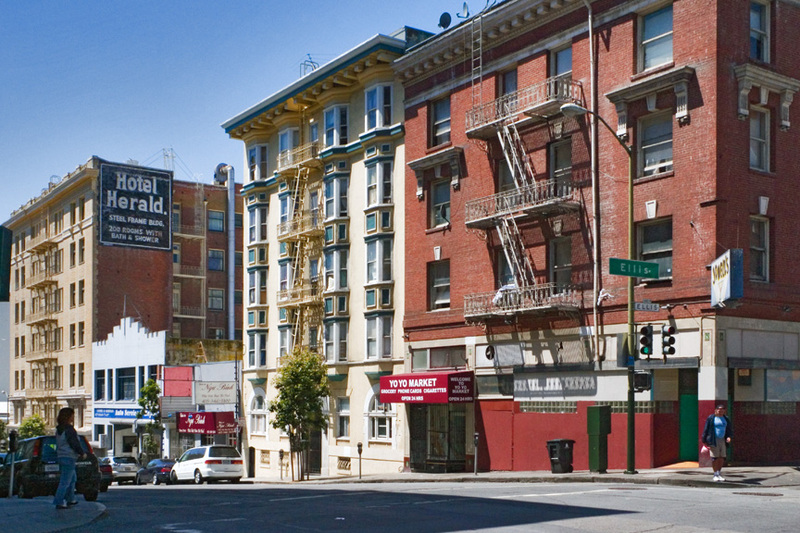 The parking lot on the corner of of Turk and Hyde is the site of the legendary Black Hawk nightclub, where on the evening of 21 April 1961, Miles Davis recorded his landmark album, Miles Davis In Person Friday Night at the Blackhawk, San Francisco. Black Hawk nightclub, 1959. Local artist Robert McClay (left) and John Lewis of the Modern Jazz Quartet outside the entrance to the club. The Modern Jazz Quartet’s first West Coast club date was at the Black Hawk. Other notables who performed there included Shelly Manne, Thelonius Monk, Cal Tjader, Vince Guaraldi, Mongo Santamaria, Charlie Parker, Lester Young, Billie Holiday, Art Tatum, Dave Brubeck, Dizzy Gillespie, John Coltrane, and many more. Johnny Mathis was discovered at the Black Hawk. When a local sextet brought young Johnny to one of the club’s regular Sunday afternoon jam sessions in 1955, club co-owner Helen Noga heard him sing and decided that she wanted to manage his career. Shortly afterward, Johnny got a regular gig singing at Ann Dee’s 440 Club, and Helen talked the head of jazz A&R at Columbia Records, George Avakian, into seeing him. After coming to the club and hearing Johnny sing, Avakian sent a telegram to his record company: “Have found phenomenal 19 year old boy who could go all the way.” And go all the way he did. Top Drawer, 1964. After its final closing, the Black Hawk was briefly reincarnated as the Top Drawer lounge. The building under construction in the background is the Eddy Street Central Tower (now one of the Mosser Towers).